ok, i'm back from the road and have sorted out the stuff requiring immediated attention. saw two (well, almost three) great bands in two days. had a great time. (scene #1): picture me and my buddy pete (a huge dp/morse fan) in his cherokee truck at the u.s. border. [immigration officer = o] why are you going to the united states? [o] what is the concert? [o] what's that? is it a band? [o] do you have the tickets? [o] yeah, but it's probably sold out?! [o] do you have a confirmation? [o, looking suspicious] what do you have in the back? [o] that's ok, get in. [portier] so where are you from? [p] come here for vacation? [me] no, just for the weekend. how much would be a cab to the imac theater? [p] (this and that). are you going to see this japanese piano player? [me] we've just driven 500 miles to see them, so they BETTER be good! after almost a 9 hour drive complicated by what seemed like a torrential rain, we arrived to long island. checked into the motel and took a cab to the venue to pick up our tickets. there were two shows that day, at 8pm and 10:30pm, both smb/dregs. we were heading for the second one. should have gone for both as i now realize, but having to be there by 8 was a little too tough of a drive. i asked the bouncers if 10:30 is when the doors open or the show actually starts and got an answer that that's when the show is supposed to start (yeah, right!). we retired to a pub conveniently located right across the street. not bad if pricey concidering the ridiculous exchange rate that canadian dollar enjoyed recently. returned to the venue around 10:15 only to see the people just start getting out from the 'matinee' gig. they barely managed to empty the place by 10:30. got in at around 11:00, checked the bars (yukes!) and merchandise stall. $20 t-shirts were all gone. they also had a bunch of cds on sale for 20 bucks each. couple of reissues of early smb and a variety of solo projects by present smb/dregs members. the venue ( http://www.imactheater.org ) is an old movie theater now run by a non-profit organization that tends to bring in mostly jazz acts. *very* nice place. has about 20 rows of seats, all in rather steep amphitheatre, so wherever you seat, you get an excellent view of the stage. no bad seats, only excellent and good ones. total capacity probably about 800-1000 people, not quite sold out. the show started at around 11:15, preceded by a brief introduction from the promoter: no audio or video recordings, but taking pictures is ok, even with a flash. bummer! the show itself was, well, nothing short of stunning. they started as a trio: steve, dave larue and van romaine. played several smb tracks (sorry, i couldn't recognize all of them). steve's hand was in much better shape than on montreux broadcast. if you didn't know his wrist is broken, you couldn't tell there's something wrong. the cast was gone, he weared sort of a semi-rigid band/bracelet extending half way up to his elbow, silverish in colour. could very well pass as a part of heavy rocker attire, not a med thingy. his playing ability is 100% restored, but obviously still was quite painful. at one time during the keyboard solo, he got out of the spotlight and was holding his arm up doing finger excercises to restore blood flow (or as it seemed to me). approx 40 minutes later the trio was joined by jerry goodman on violin. bummer! his amp didn't work, so some hastily running technicians were observed on stage. steve immediately sensed this and filled in the violin parts on guitar. they finished the track and during an unexpected intermission steve entertained the audience with some petty chat. rik emmett might do a better stand up comedy, but the impromptu bluegrass-ish jam that followed was a real treat. 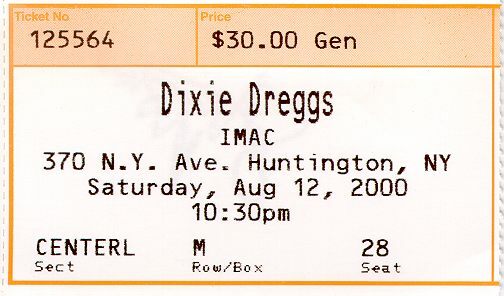 van romaine retired backstage and the band was joined by t lavitz (keyb) and morgenstein on drums, so the smb smoothly became dixie dregs. they did a variety of dregs tracks, most of them appearing on the live album. they also did =birds of fire= of mahavishnu fame followed by =the bash= at which point i almost wet my pants how good it was. mahavishnu is one of my all-time favs and birds of fire is probably the most favourite track (together with =dawn= and =you know you know= from the =inner mounting flame=). this weird riff played on violin and bass in unison sends shivers down my spine. almost a physical pleasure. at one point steve introduced morgenstein as being a keyboard player at heart (and before he took on drums) and even more so, a jazz keyboard player. he got out of his kit and did a very nice bebop duo with lavitz (morgenstein on electric piano and lavitz on hammond). lovely! a special treat was saved for the encore: double drum solo performed by van romaine and morgenstein. they switched doing solos and keeping rhythm for good 5 mins or so. very tight. this followed by a jam with all of the gang on stage. naturally, everyone got a solo spot or two. overall, a fantastic gig! yes, you hear this from a guy who find most of the smb albums boring (music for musicians, not for ordinary fans). had *one* at the same pub and got outdoors to wait for our cab to take us back to the motel. cabbies in long island are definitely not in a hurry and take their time. while waiting, we see a rental ryder truck pulled to the front door (no back doors apparently) and the roadies load it with equipment. the truck left and nobody else, but steve himself shows up, in his beach sandals and carrying his guitar and overnight bag. he's still been awaited by about 20 fans, whom he entertained in his usual down to earth manner. all the pictures were taken, all the stuff signed (one guy had a HUGE pile of magazines and cd booklets), all the questions answered. 'how's your wrist?' - 'it sure hurts like hell!'. he was back wearing the cast. got up in the morning and decided to pay tribute to this other guitar player that is living in the neighbourhood. breakfast at the normandy inn -- what a way to start a day! yeah, right! the place is closed on sundays. medieval mayhem? say hi to lady robyn? another bummer. lady robyn is on vacations until monday. the place is closed too. ok, now onto the upstate tour: get to utica, where we're meeting with jim for a jethro tull show. we originally planned to see them in montreal, st.denis theatre (same place as the purps played in '96), but montreal was sold out 5 weeks in advance. utica is a lovely small city approx halfway between new yourk and toronto. very clean and quiet, if not too quiet. guess what? the irish pub around the corner from the venue is closed on sundays. there must be something fundamentally wrong with utican irish! jim was already on his way, so some emergency cellphone calls were made and messages left to divert him to a nearest fine establishment where three gentlemen can indeed entertain themselves for a pint on a sunday afternoon. as it was discovered later, the message reached him only at 5:30am next morning, waking up the whole gang and putting jim into lots of worrying about his family. the entertainment provided proved to be so smooth that we almost missed the start of the gig (apparently, the opening act so well advertized on the marquee, disappeared into the void). when we entered the hall, the first song was already being played. had to resort to not so perfect (still not bad) seats at the back. the venue looks like a rather lavishly decorated theatre circa late 1800s - early 1900s. strange to see a rock band playing such place. tull were up to the expectations, except for rather quiet sound. i like it loud, this wasn't. the setlist they played was mostly 'greatest hits' type with occasional newer track tucked here and there. most of the old stuff was performed very well and tight with some exceptions (most notably, thick as a brick medley) that are obviously out of the ian's present day vocal range (draw a parallel with this singer from another band often discussed here). i actually like their two last albums very much and would love to see more of the new stuff played live. there's an obvious obstacle to this -- fans expecting to hear old hits. i like the way dream theater handled same situation on their last tour. they played the whole new album live which took a bigger chunk of the show and then did a 30 min medley encore of the older hits. i'd love to see more bands (notably tull and purple) following the same idea. it might require certain guts to do so, but what the f*ck?! the promised sixpack awaiting us back at the motel turned out to be .5% 'ale-style beverage' (no, i'm not pointing any fingers here! ), so pehaps one routine turned out to be almost perhaps none. had to fix it the next day. thanks everybody for reading this rant.